RANGOON — Galleries in downtown Rangoon are preparing to jointly host exhibitions as part of the Yangon Art and Heritage Festival, which will be held across the city next month. Part of the larger festival organized under the theme “My Yangon My Home,” more than 10 art galleries will celebrate the beauty of Burma’s biggest city, its timeworn architecture and the people that call it home. “I am living in Yangon and working here. The value of the buildings downtown can’t be assessed. I worry that those buildings might disappear and I love Yangon, so I am participating in the festival,” said Ko Sid, founder of the Myanmar Ink Art Gallery. During the whole of March, Ko Sid said he will separately show collections from three artists under the unifying theme “We Love Yangon.” About 50 paintings depicting the colonial architecture of Rangoon and its bustling street life will be on display. The Yangon Art and Heritage Festival will run from March 1-22 and will also include photography competitions, cartoon and sculpture exhibitions, and musical performances at a variety of public venues, as well as at the residence of the British ambassador, whose embassy is supporting the event. Aung Myint Tun, manager of the Lokanat Gallery, said they will have a solo show of gallery member and artist MKM, who specializes in artistically rendering the buildings of the downtown area. The show, “About Yangon: Extension,” will be held from March 1-7 as part of the festival. “It’s good to have this kind of festival. We will be more mindful of the surroundings in which we live and be cognizant of [the value in] preserving the city’s ancient buildings. Instead of neglecting them, we can be more aware of them thanks to this festival,” MKM told The Irrawaddy. 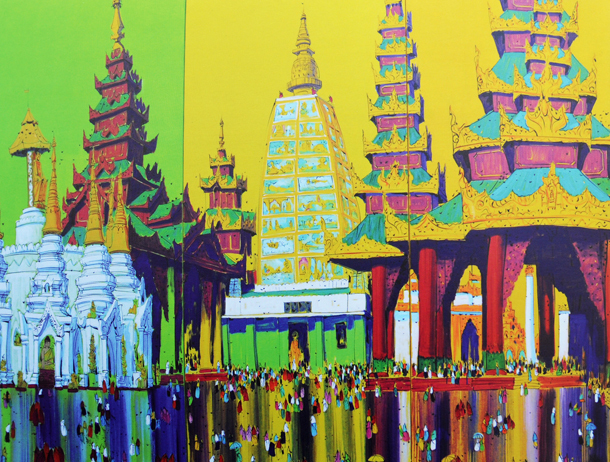 The painter’s works depict downtown streetscapes and scenes from Shwedagon Pagoda, Burma’s most sacred Buddhist shrine.